Baseball style caps are a popular way of presenting your company’s logo to the world. Because they are worn in public, custom corporate hats are superior marketing tools that will help to get your company logo and name recognized by more people. Unlike traditional printed ads, they continue to come into contact with potential customers during all areas and in a wide range of areas. Not only are our custom caps a fun and casual clothing option that many people like to wear, but also an easily recognizable method of branding. They offer affordable solutions for use as corporate gifts as well as promotional giveaways or prizes. At Speedee Shirts, we create custom baseball hats for a wide variety of needs. If you need matching hats for your team, just choose the style and color that you want. We will make custom team hats that have you logo and/or team name for the ultimate way for your team to show unity. 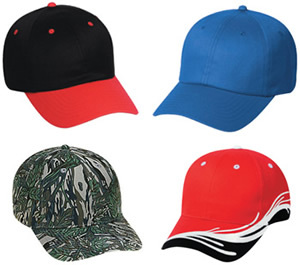 Otto International, Inc., supplies us with a choice of more than 5,000 styles of caps at a significant discount so that you can choose the best hats for your organization and a reasonable price. Once you make your choice, we will take care of the printing to make the perfect hat that the entire team will wear with pride. We are fast at producing quality custom school hats, team hats, corporate hats or hats for any occasion. Our many years of experience have taught us what our customers want and how to create the custom caps that they will be happy with. We will work with your specifications to create the baseball hats that you have in mind. We also offer many other items that we specialize in to create the printed items that you need for fun and business. Just browse our site and see what great products we can make for you! We have t-shirts, sweatshirts, banners, signs, mugs and other custom promotional items. Encourage team spirit or company loyalty with the right choice in custom printed products from Speedee Shirts!